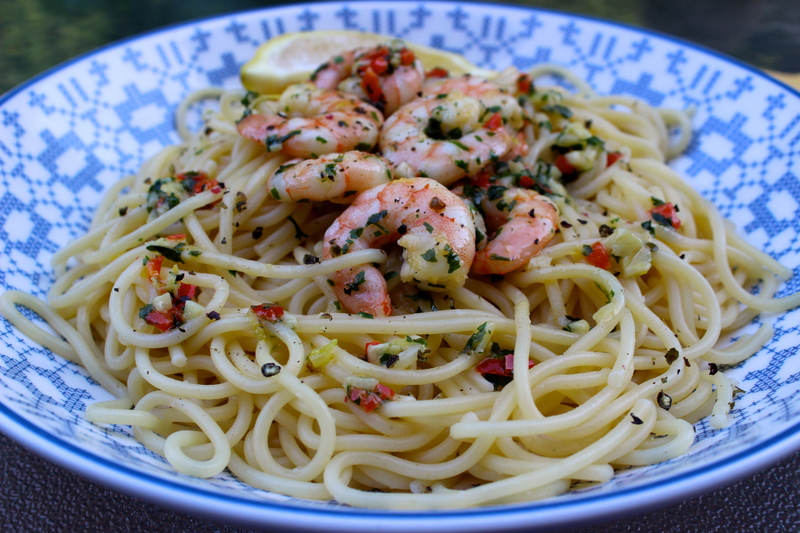 Linguine with prawns flavoured with chilli, lemon, garlic and parsley. One of the tastiest seafood pasta dishes you will try and it’s all ready in less than 15 minutes! I came up with this recipe when I was on holiday in Sardinia a couple of years ago, where the majority of our meals were based around the fresh seafood on offer and most nights we ate pasta. This dish is perfect to eat anytime of year – it’s a great al fresco meal for the summer, but also extremely flavourful and warming in the colder months too. I love this recipe because fresh flavours are brought together to create an amazing seafood dish that takes hardly any time to make and has to be one of the best dinners you could eat! Just eating this dish transports me back to the beautiful sunny Italian island! Pasta dishes are definitely one of my specialities! Pasta is a very versatile ingredient, I have shared many different creations on the blog so far, including this spaghetti with marinara sauce and this delicious pesto linguine with halloumi cheese and roasted tomatoes. 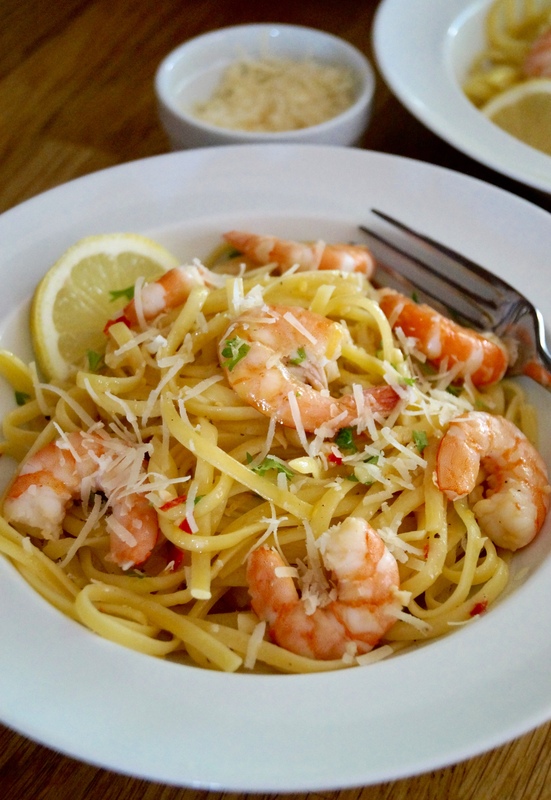 This linguine gamberi is truly one of my go-to quick dinner recipes. It would definitely be my last meal on earth – I LOVE anything with garlic butter! The recipe is based on one of my favourite pasta sauces, aglio e olio – which is simply a sauce made out of garlic oil, you can also add some pepperoncino (chilli flakes) if you like too! 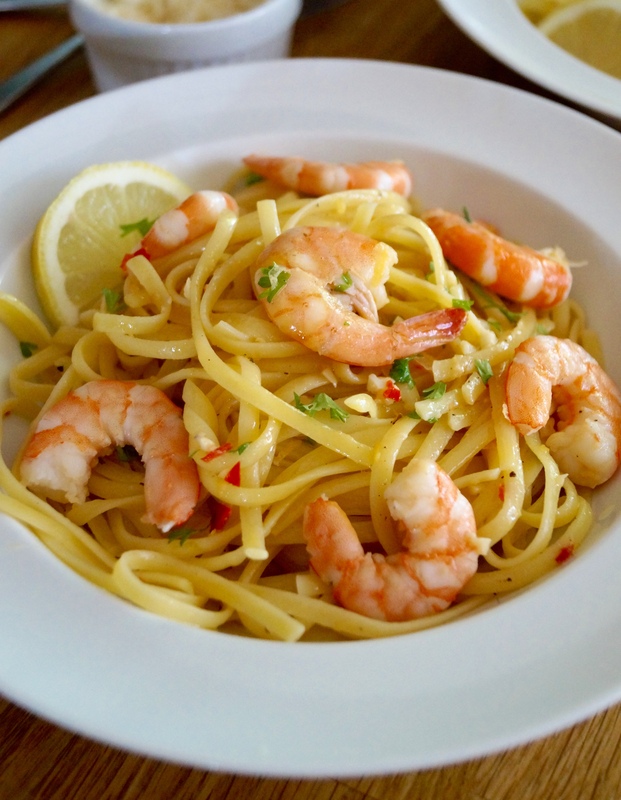 All you have to do to make this dish is cook some linguine or any other of your favourite pasta shapes, flavour the oil with garlic, red chilli and lemon, then gently cook the prawns. Add some butter – which adds the indulgence and helps keep the prawns tender and then toss together with the cooked drained pasta. It couldn’t be any simpler! I don’t know anyone who wouldn’t love a bowl of this pasta for their dinner! Comfort food to the max. This is sure to impress anyone who tries it! Serve with a big glass of chilled white wine for the ultimate dinner, perfect for any night of the week! Enjoy the recipe guys! 1. Cook the linguine in salted boiling water according to the packets instructions. 2. Once the pasta is near enough cooked, add the olive oil to a large frying pan. Gently sauté chopped garlic, chilli and lemon zest until fragrant, then add the prawns and the lemon juice and continue cooking for about 3 minutes or until they start to turn pink in colour. 3. Once the prawns are cooked add the butter and cook on a medium heat to warm the prawns completely through and melt the butter. Toss the drained pasta and prawns together in the pan. I also like to sprinkle over a little freshly grated parmesan too. Serve in pasta bowls and enjoy! Oh this looks good, real good! It’s actually just made me super hungry. Thanks so much Matt! Glad you like it! You’re making me so excited that I’ll be eating in Italy by the end of the week! Looking forward to delicious meals like this! This is definitely comfort food! And you’re right – who doesn’t love a gorgeous bowl of pasta like this?! Thanks so much Eva! It certainly was total comfort and delicious! oh my gawd, this is one of my faves!!!! 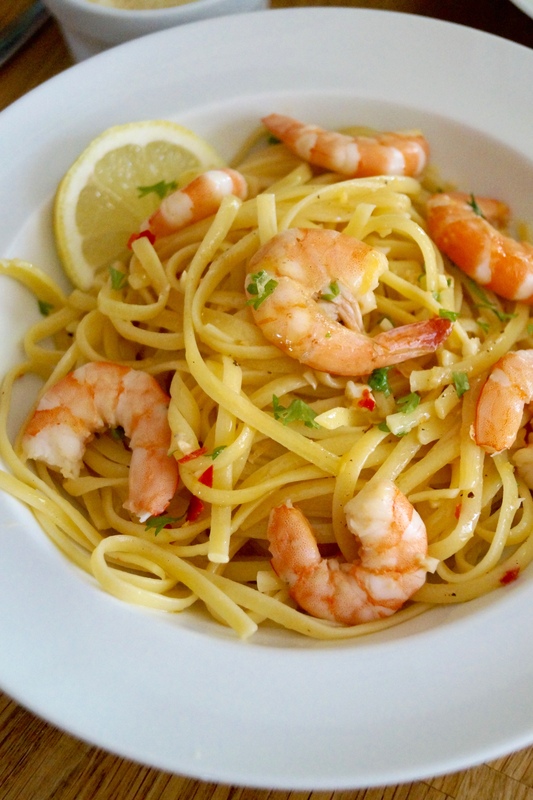 love prawns with pasta!!!! I SO want some right now!!! I love seafood dishes like this! This pasta sounds amazing, Jess! Love the prawns and spices! Totally agree with you, Jess – this is one of the most scrumptious and hearty pasta meals I could even imagine. Sometimes I substitute parsley for other herbs (thyme or even rosemary), and that always works! Thanks Ben – it’s definitely one of the best pasta dishes! Love the idea of using thyme or rosemary as well, going to try that next time! Love pasta and this looks awesome! Love the addition of shrimp, too! Pinned! Mmmmmm…..looks beyond yummy!!!! 🙂 Thanks so much for sharing this with us. Thanks for the lovely comment, Kloesunny! Glad you like the recipe! This pasta looks incredible, Jess! Love the flavors, so fresh and delicious! This dish looks amazing! I love seafood and pasta but I especially love seafood IN pasta. I am favoriting this and can’t wait to try it! 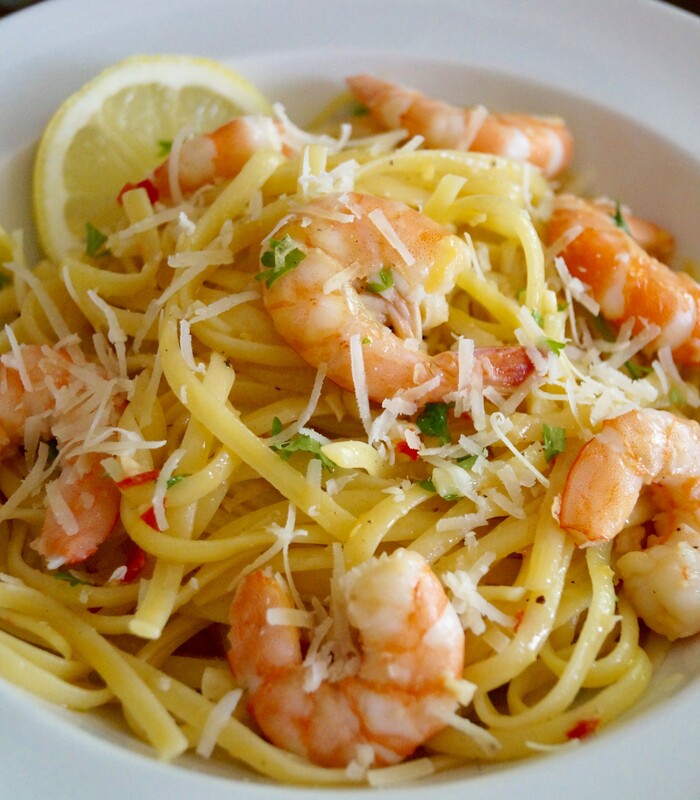 Pasta with shrimp is one of my favorite meals! Love how quickly this meal comes together! What a beautiful bright dish. I love these oil based pasta recipes. They are light but have so much flavor! This pasta looks perfect! I love how quick and easy it is. The flavors sound deeelicious :). This looks wonderful, Jess! I love simple pasta dishes like this where all of the flavors can really shine! Indeed this pasta bowl looks so hearty and comfy. Loving all the amazing flavors here! YUMMY! I always follow your blog to read the English point of view – I was a student of foreign languages at the University! Glad you’re enjoying my recipes – that makes me very happy! Beautiful!!!! Lovely photos and I bet this recipe tastes amazing! I totally get what you’re saying about pasta being a versatile ingredient! It’s absolutely amazing how different cultures absorb it into their cuisines! In China, there’s this kind of pasta that you make it by pulling the dough. It’s absolutely delicious and wonderful! A great recipe for a great dinner ! Looks so good Jess ! Sardinia is great and makes you want eat things like this all the time. The fish is great and you get so much inspiration from that stunning island. You are right, pasta is such a joy to cook with, anything you throw at it tastes good. But seafood always works perfectly, especially with parsley.